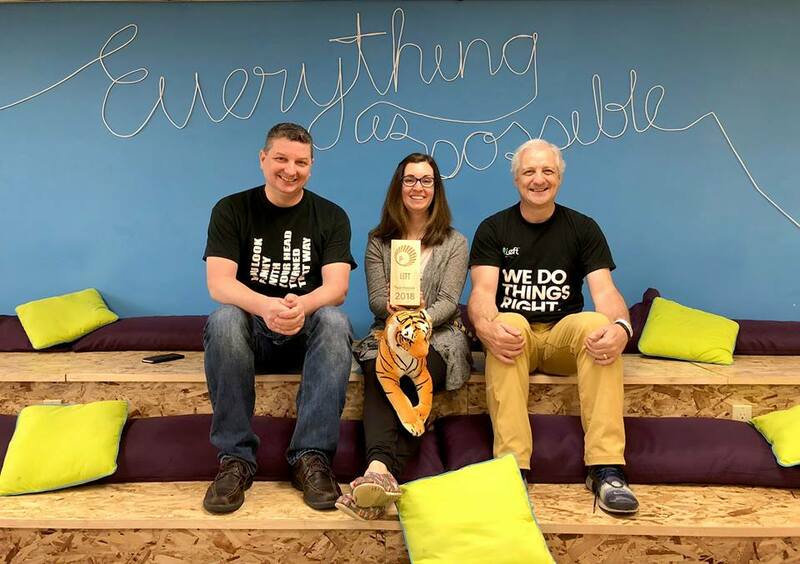 At Left, we’re incredibly proud of our award-winning team! This past year the team was recognized for the efforts of many years of hard work, dedication, and — of course, our vibrant culture that exists because of our awesome Lefties. Read on for the summary of the awards we were recognized with this year. 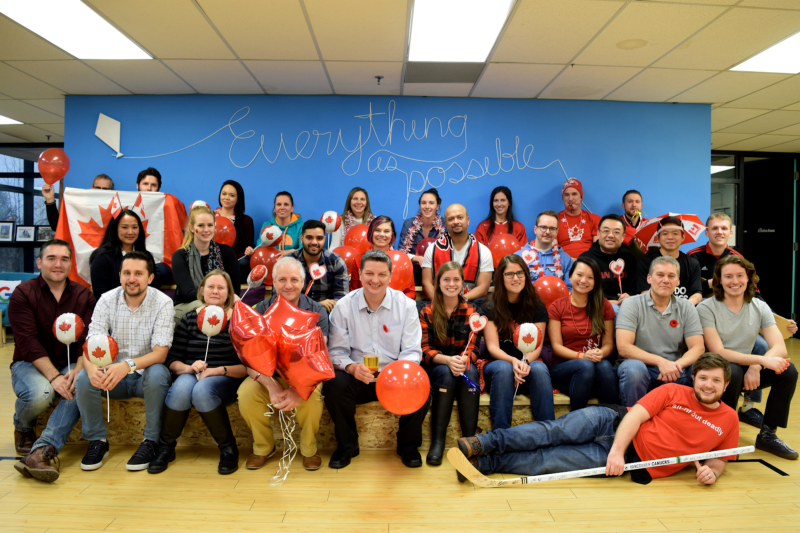 Left was named one of Canada’s Top 100 Employers on Mediacorp Canada Inc.’s 2019 list. 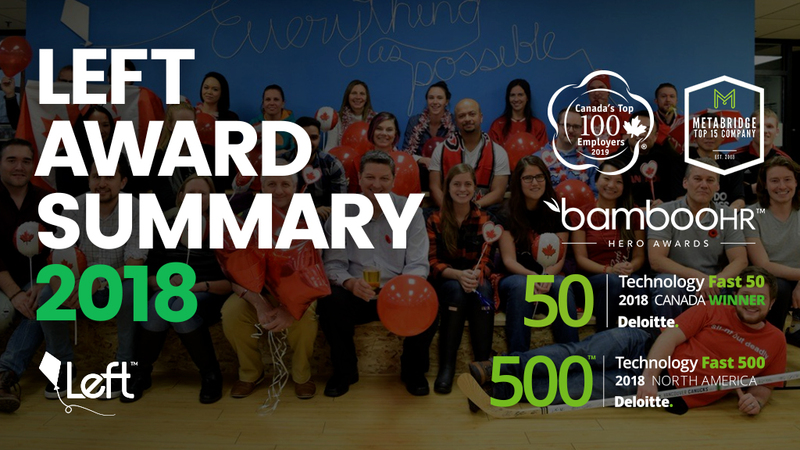 With only 36 Canadian-based employees at the time of the application, Left was the smallest company of the top 100 organizations, some of which had up to 65,000 Canadian employees. Now entering its 20th year, the 2019 Canada’s Top 100 Employers List is a national competition to find employers with exceptional human resources programs and forward-thinking workplace policies. Employers are rigorously graded by Mediacorp Canada Inc. on eight criteria, and still there are an increasing number of applications each year. Left’s scores for the eight categories of criteria were: Physical Workplace (A+), Work Atmosphere and Communications (A+), Financial Benefits and Compensation (B+), Health and Family-Friendly benefits (B+), Vacation & Time-off (A-), Employee Engagement and Performance (A), Training & Skills Development (A+), and Community Involvement (A+). An internal analysis of the scoring revealed that with those ‘grades’ and only 36 employees, we earned a ‘GPA’ of 3.63, which placed us in a tie for 7th place in the top 100 organizations! Read the full release on Canada’s Top 100 Employers here. Left was selected from hundreds of nominations based on its rapid revenue growth, entrepreneurial spirit, and bold innovation. Our organization earned the spot as 16th on the Deloitte Technology Fast 50™ list in Canada, and 101st on the Deloitte Technology Fast 500™ list in North America. Left’s impressive revenue growth of 409.08% from 2014–2017 on the strength of its subsidiary, Left Travel Inc., was a deciding factor in making both lists. Read the full release on Left being recognized by Deloitte as one of the fastest growing technology companies in Canada. Left was proud to be the recipient of the High Impact Hero Award, presented at the BambooHR Summit. The ‘Hero Awards’ recognize companies that excel in various areas of human resources within the company. Award finalists were selected based on the quality, impact, and results of their programs. They were then interviewed by members of the BambooHR Hero Awards Committee. Winners in each category were selected based on the strength of their specific programs and passion for HR. The ‘High Impact Award’, is given to a company that exemplifies general greatness in HR and has developed particularly effective HR programs. Left’s Dream and Community Engagement programs, were standouts as effective components of our overall culture and our 95% voluntary retention rate. Read the full release on Left being selected for the High Impact Hero Award here. Metabridge selects the most innovative, high growth technology scale-ups to be in the Top 15 Canadian Scale-ups, which Left was honoured to have been selected for. Left Co-Founders, Chris Jensen and John Lyotier, attended the Metabridge executive retreat where they were able to disconnect and network with like-minded peers and technology leaders. While at the retreat, Left was selected by the other 14 companies of their cohort as the ‘People’s Choice Award’.